Chandler Hill “Savage” Norton Black Label Reserve | Wine Splash! Wine is an amazing adventure! Each time you open a new bottle, it always files away another great memory for the day you first tried it. And discovering great wines from Missouri is like being one of the famous explorers of early American history. Lewis and Clark, Jacques Marquette, Tom Sawyer, and Huck Finn. Once you discover a few of these flavorful wines from Missouri, you will want to find mysterious, fun, and savory wines all the time! This is how I feel about the Norton wines from Chandler Hill Winery in Defiance, Missouri. Unique, eclectic, but wonderfully flavorful! 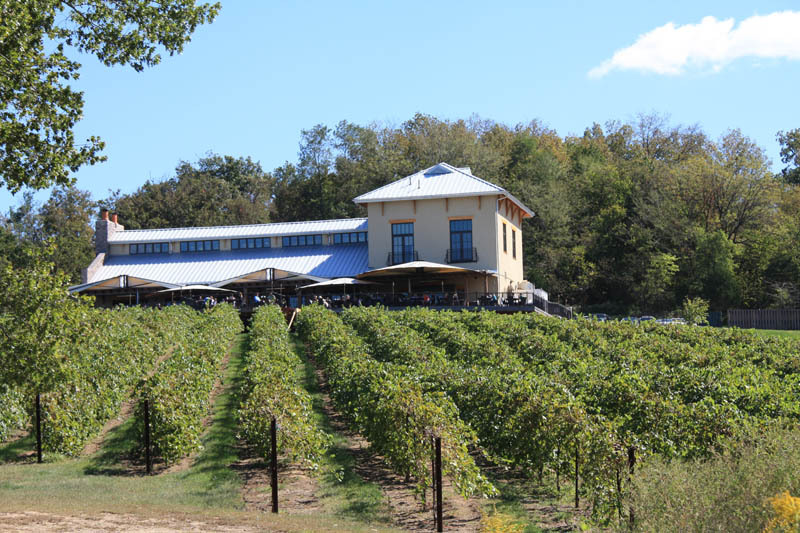 Norton is actually North America’s only true grape that is native to this country and the Augusta area of Missouri is one of the few places where it is done right. 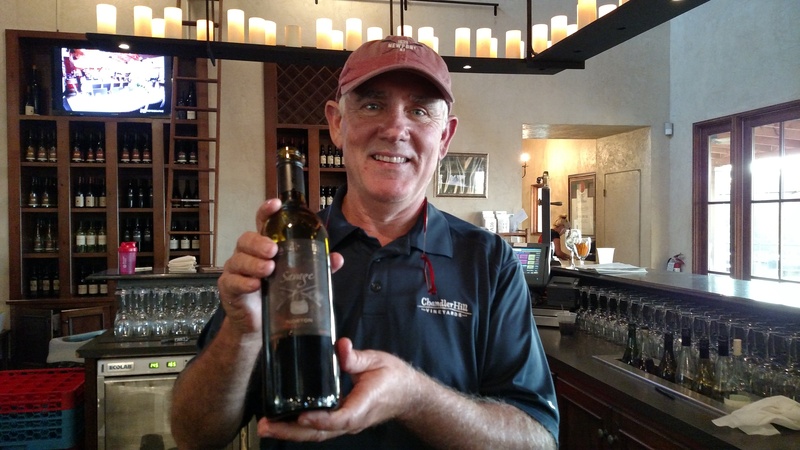 With the experience of winemaker Tom Murphy who has been in the wine business since 1994 and proprietor Chuck Gillentine at the helm, Chandler Hill Winery can’t help producing award winning wines each year! Even Chuck Wagner of Caymus Vineyards has taken notice of this little winery near the Missouri River! He recently spent a few days at Chandler Hill Winery with Chuck Gillentine as they traded experiences and wine making tips with each other. Chandler Hill Winery is beautifully stylish, modern, and has the feel of a very upscale lodge, especially on the inside! Visit the website at http://www.chandlerhillvineyards.com and you will see for yourself. Wonderful ambiance, excellent wines, great food, beautiful view, and a very friendly staff. Chuck gave us a fun and informative tour of the winery, cellar, and the vineyards. Afterwards, we were able to do a tasting which included his Missouri wines as well as the wines he produces from grapes he receives from the West Coast. Everything tasted fantastic but two wines truly stood out and both of them were Norton. The 2013 “Savage” Norton was one of the favorites and other people do agree. 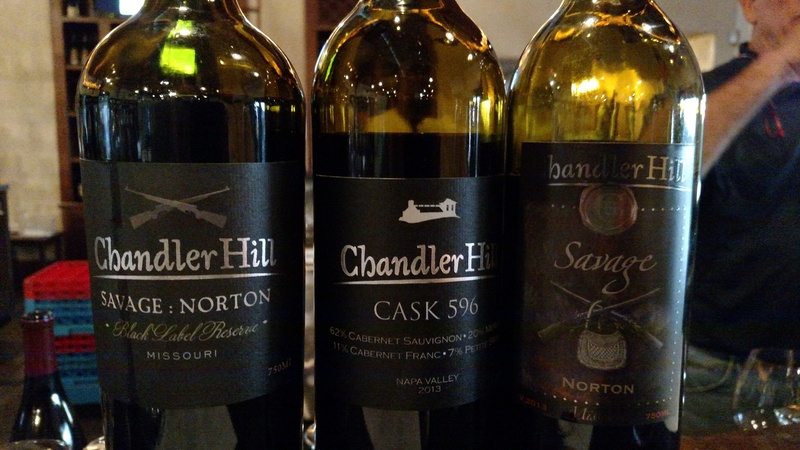 The 2013 Savage Norton won a Gold Medal and the C.V. Riley Award for the Best Norton in Missouri at the 2015 Missouri Wine Competition. Because of this high status, this Norton is practically sold out, but not to worry. Another gold medal winner at the same competition was the Non-Vintage Black Label Norton which there still is good a supply of. Hallelujah because this Norton is fantastic too! This Non-Vintage Black Label Norton is a deep ruby red in the glass with a hint of purple along the rim. Intense aromas of blackberry jam, black raspberry, nutmeg, and anise aroused my senses! Full bodied across the palate, velvety mouth-feel with a touch of tannin grippiness. Bold, yet inviting flavors of ripe blackberry, black currant, fig, tobacco, and notes of elderberry. It truly has great savoir faire! On the second sip, voluptuous flavors of blueberry, mocha, leather, and a hint of vanilla oak evolved on the long, creamy finish. Tremendous fruit but eloquently complex and balanced. If Chandler Hill Winery wanted to put my taste buds into orbit with layer upon layer of flavors, then mission accomplished! This Norton would pair perfectly with red meat, wild game, lamb, medium to sharp cheeses, and full flavored foods. 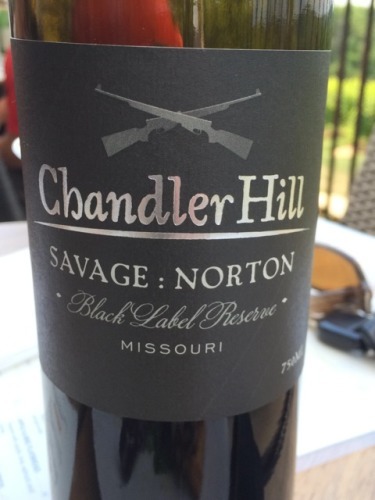 We feel this Chandler Hill “Savage” Norton Black Label Reserve is a definite 94 Point wine! It is about as perfect as any wine can be so visit Chandler Hill Winery soon and stock up on this amazing Norton because it wins a gold medal all the way around! WineSplashing! !